Air Vision slot Diffusers are available with 1-6 slots. The diffusers are a attractively designed from extruded aluminum sections alloy T6. Supply section may be supplied with a simple but efficient hit and miss damper, which is black painted to give the desired appearance. Recommended room height for this types of diffusers is 2.6 to 4.0m. While the recommended supply air temperature difference is 10K. 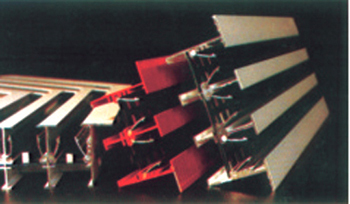 Air deflection blades are provide to adjust air discharge direction, vertically and horizontally. Note : All dimensions are in mm with tolerance of ±2.5mm unless otherwise specified.